Quantity surveyors are responsible for managing all aspects of the contractual and financial side of construction projects. They have a detailed and comprehensive knowledge of construction and construction methods, as well as the laws relating to construction projects and accounting, in order to provide cost and financial advice. They may specialise in mechanical or electrical disciplines, but all professional quantity surveyors must have a working knowledge of the practical aspects and design features of both fields. assess the financial costs of new environmental guidelines. Why did you choose this profession? I read an article about it whilst I was in matric. The skills required by a quantity surveyor appealed to me and I applied to study at both UCT and Technikon. I was fortunate enough to be accepted at UCT. What is a quantity surveyor? Quantity surveyors act in liaison with architects, consulting engineers and contractors to safeguard the client’s interests. They are independent experts who operate in a specialised area of the construction industry; the financial consultants of the industry whose training and experience qualify them to advise on cost and contractual arrangements, as well as providing property development advice. What training did you do? 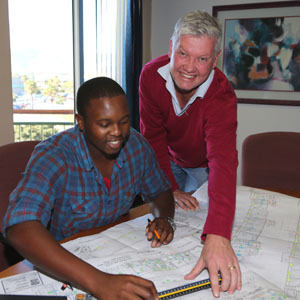 I studied the five-year degree course in quantity surveying, BSc (Quantity Surveying), at the University Of Cape Town. Is there a type of personality best suited to this work? You should be highly numerate and analytical, enjoy working with finances, be able to pay attention to detail and possess good communication skills – both written and oral. Is experience as important as formal training? Yes, I believe it is. Any candidate quantity surveyor should be prepared to spend at least three years gaining experience, and provide a logbook of that experience in order to register as a professional quantity surveyor. Describe a typical day on the job Days normally involve meetings (either in the office or on site) and telephonic and written communications with professional persons, including architects, engineers, building contractors and clients. Alternatively, the day would be spent preparing or checking calculations for estimates, working on tenders, monthly certificates and final accounts. What do you like the most about your work? The opportunity to provide accuracy and detail whilst under pressure, and to meet realistic deadlines for projects that have been properly planned and/or designed and have a good chance of fruition. My training and experience as a quantity surveyor has given me the opportunity to work in other parts of the world, including Namibia, United Kingdom and the Middle East. What’s been the highlight of your career to date? Starting my own sustainable registered quantity surveying practice has been the highlight and most rewarding part of being a quantity surveyor. What are your goals for the future? To grow Mike Kleve Quantity Surveyors in order to provide a quantity surveying service not only locally and nationally, but perhaps also internationally. What advice would you give to someone starting out on this career path? Be patient and be prepared to learn the basics from a registered professional quantity surveyor. Describe your job in three words Professional, pressured and analytical. An accredited degree, diploma or professional qualification is needed in order to enter the field of quantity surveying. Relevant subjects include surveying, construction, civil engineering and structural engineering. Graduates are required to complete 2/3 years’ practical work under the supervision of a qualified quantity surveyor. They can then do a professional ability test, after which they can register with the South African Council for Quantity Surveyors.